On Thursday, June 19, 2014 at 19:11:11 UT a Dnepr rocket was launched from Dombarovsky near Yasny in the Russian Federation, 12 of the satellites on-board carried amateur radio payloads. In total 33 satellites were deployed from the Dnepr on June 19. One of those satellites UniSat-6 carried four smaller satellites, Tigrisat, Lemur 1, ANTELSat and AeroCube 6, which it deployed on June 20. On June 23, AeroCube 6 split into two separate satellites bringing the total of deployed satellites to 38. Among the amateur radio payloads are a SSB/CW linear transponder, FM voice transponder, D-STAR Parrot Repeater, three Packet Radio Digipeaters and APRS. 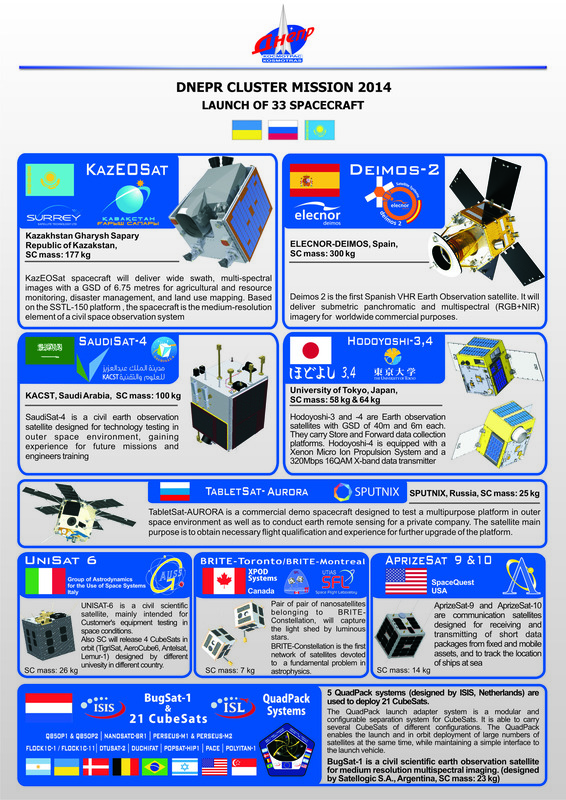 In the hours immediately after launch signals were reported from POPSAT, QB50p1, QB50p2, UniSat-6, BugSat-1, NanosatC-BR1, Duchifat-1, TabletSat-Aurora and DTUsat-2. 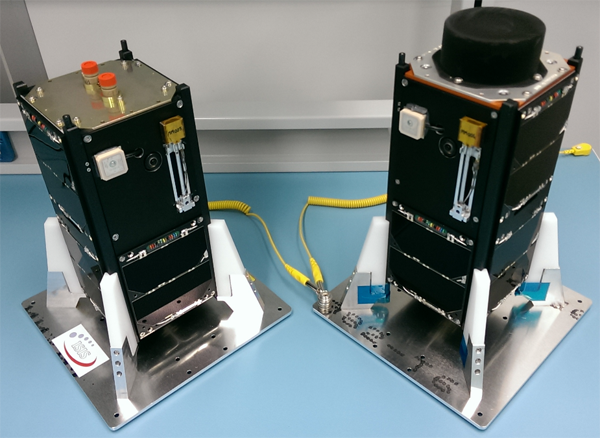 The two QB50 precursor Cubesats on the launch carry amateur radio transponders. They were deployed at 19:32 UT and CW signals from both were received shortly after by Andre Van Deventer ZS2BK in Port Elizabeth, South Africa. Brian Best ZS5SB and Leon Steenkamp ZS1HD also reported receiving signals. The FUNcube team send their thank to the stations in South Africa who received the first signals and also to the ISIS teams both at the launch site and at their HQ in Delft. A job very well done! Richard Dailey N8UX in Kentucky, USA made use of the Southampton University Wireless Society (SUWS) WebSDR to receive the QB50P2 beacon when the satellite was in range of the UK. QB50p1 carries the FUNcube-3 400 mW inverting linear 435/145 MHz transponder provided by AMSAT-NL with support from AMSAT-UK. QB50p2 carries a 435/145 MHz FM transponder and FX25 data transmitter from AMSAT-F. It is expected that both these transponder payloads will be activated after the science missions have been completed.